We have another LHC update for you guys today. India is hosting the Lepton Photon meeting, and the talk is again about this boson. And, for the moment, we’re not much closer to knowing whether it exists. The search for the Higgs involves modeling what sort of particles known processes generate at specific energies (because e = mc2, these energies correspond to masses). We can then compare that to what is actually seen in the detectors. If the detectors see the predicted number of the particles at a given mass/energy, we can exclude that from further consideration. If we see an excess, then this might indicate that the Higgs resides at this mass. Both detectors at the LHC, ATLAS and CMS, have increased the amount of data they have run through this analysis pipeline (more data from this year are now included). 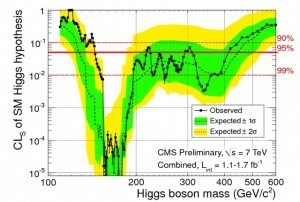 Each has identified ranges of mass that they can say don’t hold the Higgs with a 95 percent certainty. For example, CMS hasn’t been able to eliminate the possibility that the Higgs is between 216 and 226GeV, but the ATLAS team has. CMS indicates its analysis used anywhere between one and 1.7 inverse femtobarns, a measure that corresponds to the total number of collisions analyzed. Some of that data was obtained last year, and it’s only a slight boost from last month’s figures. There’s much more data on the way, as the detectors have recorded 2.5 inverse femtobarns this year alone. We’re definitely at the point where there will be very little room for the Higgs to hide by the time all the data from this year’s run is analyzed. Next Astronomers find Diamond Planet!